After walking out of a thankless job at a prestigious marketing firm, feisty California entrepreneur Louisa Gibson is going into business for herself. Lou's pioneering venture, The Mormon Bachelor, is a reality dating web series sure to be fabulous advertising for her new marketing firm. And as a bonus, she can solve a problem close to home: while Huntington Beach is crawling with eligible, sun-bronzed Saints, they've forgotten the vital skill of dating. Lou hopes the reality show will finally inspire this group of hangout enthusiasts to pair off. But shortly before filming begins, the unthinkable happens -- Trentyn, a.k.a. The Bachelor, gets a girlfriend. And Lou needs a new leading man -- fast. Enter Nick, Lou's devastatingly handsome ex-boyfriend. He's the stereotypical actor: shallow, self-serving...and perfect for the job. A whirlwind of dating ensues, with Nick at the center of it all. Things are going according to plan -- that is, until Lou is forced to step in as a substitute bachelorette, becoming an unwitting cast member on her own show. Despite Nick's attempts to reestablish their friendship and the growing spark between them, Lou is determined to keep her distance. The show must go on -- but what's a girl to do when the Mr. Wrong of the past just may be the Mr. Right of the future? I'm a huge Melanie Jacobson fan. She is on my auto buy list. I don't even need to read the preface to know I want her books. She gets me and what I like to read. I trust her writing. Now, for the review... Great cover! I love a good beachy book cover. Don't you? It looks calm and inviting. If I was passing a book store and this was in the window I would stop to buy it. It fits with the story too. Which is always a plus! Did you read The List? 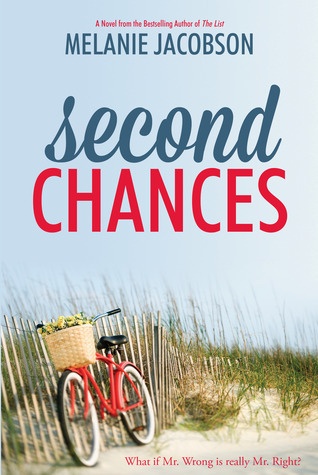 Well, Second Chances is a companion novel of sorts. This book is about Louisa, Matt's sister. I loved The List and wanted to go back to Huntington Beach for more. I really enjoyed the whole Bachelor reality show preface to this story. It is such a fun tv show that I loved having a Mormon view of it. I just want to say that I got myself invested into this story. So much so that when a certain decision was made near the end I cried. I put the book down and cried. I couldn't read one more word. I just felt the hurt. I felt the pain and I remembered when a similar situation happened to me. I'm a happily married woman, but that just brought back memories and feelings from years ago. I sat there and let myself sob. I love when I connect with a character on a personal level. I wasn't reading fiction anymore. This was real life. These character's are real. This was such an enjoyable book. I read it in one sitting. I just breezed right through. It was easy to get into and it was comfortable. I had to re-read the ending a few times just because I didn't want to put the book down yet. I didn't want the magic to end. There were two details that I had a little trouble with. First, I had a hard time believing that Louisa and Molly could get the video episode ready in only a few short hours. With only one take. The second is all the advertising space that seemed to come so easily. This takes place in Huntington Beach. Not Utah Valley. Why would these advertisers be keen on buying space for a small video project? A Mormon video series at that! No matter how fast it went viral. But, then after reading author Melanie Jacobson's comment below it made to much sense. This story is based on a real life show. Her research reflected the real life process to the very first Mormon Bachelor. Also, Nick was already a big star in his own right. Why wouldn't a restaurant want him to advertise their product? I hadn't even thought of it that way. I'm dying to see to real Mormon Bachelor, just so you know!! So, don't forget to read Melanie's comment below for further insight. Loved this book you guys! I loved the lessons learned and I loved how the character's changed. The ending was such a surprise for me. My heart felt light after I'd been sobbing a few pages before. It was such a perfect ending. I couldn't have even hoped for better. I'll be re-reading Second Chances sooner rather than later. Thanks for the review, Mary! Here's some good news: The Mormon Bachelor webseries is REAL! And all the seasons are online! My book is loosely based on the first season (the bachelorette married the guy she picked and they have a baby now!) and I interviewed the producer extensively. Believe it or not, with one exception, this is exactly how that first season went down, complete with scrambling to get the videos out the very next morning. It will not shock you to hear that they NEVER made the mistake of doing it that way again. In future seasons, they gave themselves something like a two week lead time before airing the dates instead of the very next day. What's different is the sponsored dates in my fictional first season. They didn't do it that way on the real web show until the last season when the whole thing had some traction with viewers. But from the very first season, they had all kinds of production companies, including MTV, trying to buy the show from them. Isn't that funny? Anyway, I tried to answer the why would it go viral and why would advertisers sign on for this in the story by making Nick a guy who already had a big Internet following, and by making the advertisers not have to pay for advertising at first--just let the dates happen on their premises for free, but I can definitely understand why that wouldn't work for someone who knows more about how hard this stuff can be like you do. My point is, watch the web series. You'll LOVE it. It's been featured on everything from The Today Show to Nightline over here. Crazy! Thanks for the explanation Melanie! That clears so much up!! I didn't even think about how Nick was already a big star and that would make people want him to help advertise their businesses. It didn't even cross my mind, but it makes so much sense! I can not wait to check out The Mormon Bachelor online tonight!!!! We never get anything cool like this abroad. Thanks for the details about it too! I loved it too, Mares! Just loved it. And I adore Melanie's comment above. Leave it to the unindoctrinated to commit to editing a show overnight! Ha. But she's right, people make the mistake of underestimating the work that goes into video production ALL of the time. It seems that we run into that attitude with every new project at work. Two weeks is a decent amount of time to turn out a five-minute video with graphics. That makes sense. I actually had an acquaintance try out to be the Mormon bachelorette in the series. How cool that it actually worked out for the winner. Next time we chat I'll tell you about those experiences. I'm sure you know a few of them already. I can't wait to watch this series! What fun!! I love beachy covers!! I'm so over this winter and I just want to read some summery books! I love it when an author stops by to add a little something. It's fun!